One of my favorite events living here in California is coming up next weekend, May 18 and 19, 2013 here in Oxnard, CA. This year marks the 30th anniversary of the California Strawberry Festival. Close to $4,000,000 has been donated to local charities. In fact, it captured my imagination to the point that I created the 2009 winning poster design. Strawberries are fun and colorful to illustrate. For the 2009 poster, I created a whimsical illustration of a giant strawberry “sunning” itself at a lively party of fun, food and festivity. Photos from the 2009 poster unveiling are available for viewing. So, on May 18 or 19 take a trek out to the California Strawberry Festival at the Strawberry Meadows of College Park at 3250 South Rose Avenue in Oxnard, CA. You may even find my 2009 poster for sale at the official souvenir booth. 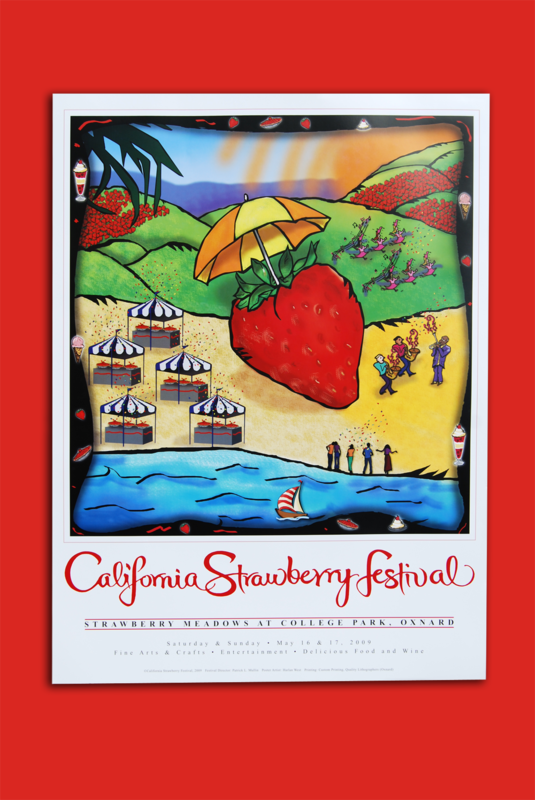 The 2009 official California Strawberry Festival poster, designed by Harlan West. This entry was posted in Iconic Illustrations/Infographics by Successful Corporate Communications. Bookmark the permalink.